The Python - the tale of two stranded pilots taking on a madman who controlled a giant robotic snake. Jack Magic - a 13th century sorcerer's apprentice accidentally transports himself to the modern day. 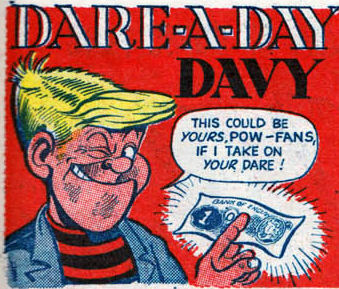 Kicks - a young boy prone to assuming different roles he thinks he might "get a kick out off"
Pow! absorbed its sister title Wham! 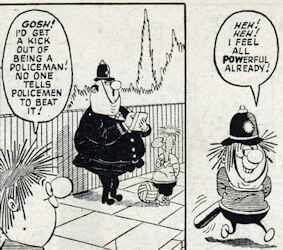 with 20th January 1968's issue #53, with four of the latter title's strips making the transition. Georgie's Germs and Sammy Shrink survived unchanged, as did the reprints of Marvel's Fantastic Four, but Wham! 's The Tiddlers was merged with The Dolls of St. Dominic's on the pretext that the Tiddler's school had burned down, resulting in the formerly all-girls St. Dominic's becoming a mixed gender school. 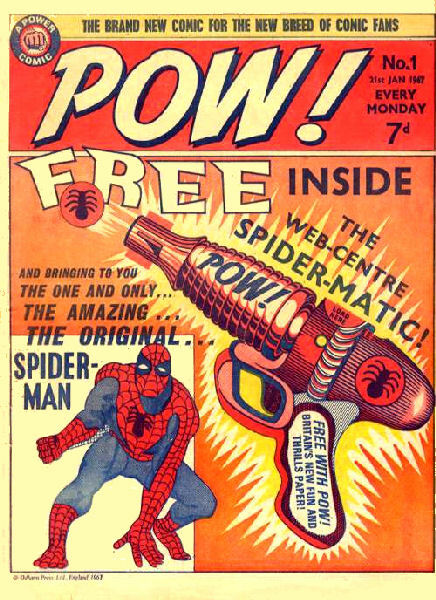 But the newly retitled Pow! and Wham! 's days were numbered, and roughly eight months later it too was axed and merged with Smash!